The hotel operates a Courtesy Coach to and from Dublin Airport. Leave the Arrival hall at Dublin Airport and head for the short term car park, walk through the car park and 50 metres in front you will find the Hotel Shuttle pick-up point. The Shuttle pick up point is a 2 minute walk from the Arrival hall. Leave arrivals hall and continue straight over the covered pedestrian bridge following the signs for Area16 / CoachPark. Descend turn left to the ground level and follow the signs for Area 16 / Coach Park. You will see a church on the right hand side, the coach car park is located behind the church. 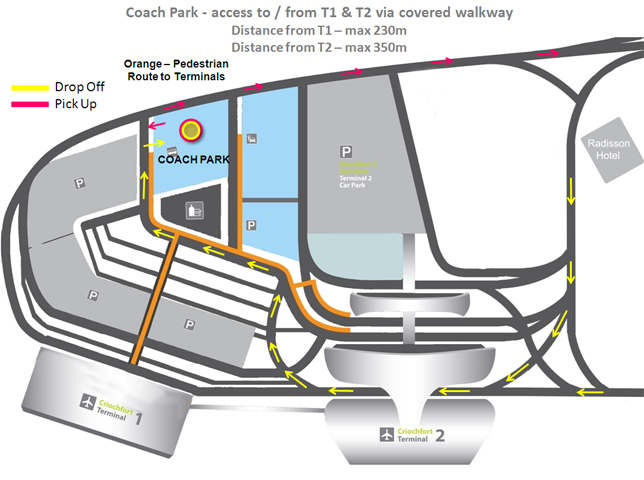 The Shuttle pick up point (Area 16 / Coach Park) is approximately 400 meters from Terminal 2 and the pedestrian path is covered most of the way. Should you require further information contact us at the express by Holiday Inn or select your dates for great hotel deals in Dublin.